While Uncharted 2: Among Thieves might have three different co-op modes, most players are going to pick it up for it's incredibly engaging story and single player. Not only is the game beautiful, it's entertaining and has incredibly high production values. The latest PlayStation 3 commercial though gives us a good idea for a Co-Op Couples article. 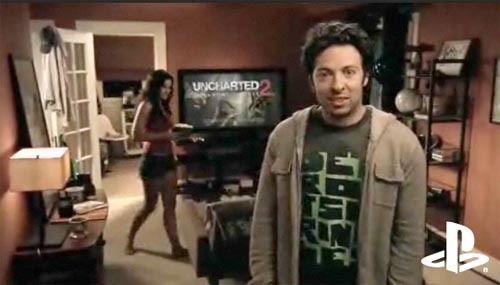 You see, Jason Melvin's girlfriend is so enthralled with what's on the screen in Uncharted 2, she actually thinks it's a movie. But Jason, now that you have her on the couch, why not fire up the game's co-op mode and play a little bit together? You can even eat the popcorn while you are waiting to be revived after dying! Page created in 0.3035 seconds.